With Ø 8.5 mm connection eyelet for the energiser. 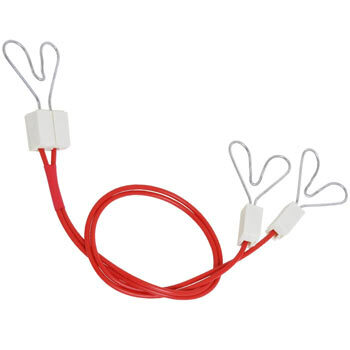 Connection cable with three practical heart-shaped clips. Extra-short cable, perfect for fences narrow conductor spacing. The connecting cables do not sag. Connection cable for broad fencing tapes up to 40 mm. With wide contact surface for an optimal electrical connection. 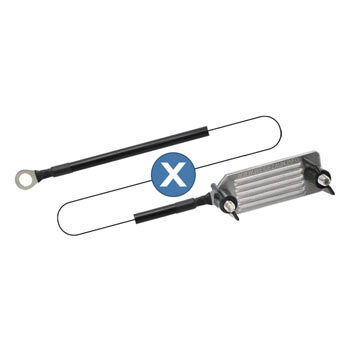 Top quality, made of stainless steel – rust-free! Connection cable for broad fencing tapes with plastic clip. Quick installation, secure connection for broad fencing tapes up to 60 mm. Connection cable for tape up to 40 mm. Easy to use and install thanks to the clip connection. An electric fence should be interconnected at evenly spaced points! 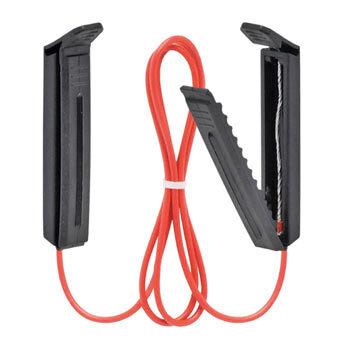 For a perfect mechanical and electrical connection between tape and rope. Very high quality and strong. With tape connection, the cable is high voltage-resistant and can be laid above or below the ground. There are various lengths to choose from. Electric fence tape does not just stand out visually from the other conducting materials, it also requires careful selection of the components to which it is connected. For example, it is possible to buy fence cables and lead out cables for electric fence tape which are impressive in terms of their high quality and which should be thought of as a separate category in themselves. Together with the energiser and fence posts, the conducting material is the most important component of the electric fence system. Electricity, which is transmitted by the energiser, flows through the conductor. If it is touched on the inside or outside by an animal, the fence releases electricity in the form of an electric shock. The short shock which is only released if the fence is touched, frightens away the animal, ensuring that it cannot damage or escape through the fence. An electric fence is only as good as its conductors, although other components are just as important, of course. Three additional products for electric fences are connected to the conducting material and are absolutely essential: Insulators insulate the electrical energy, are used for attaching the conductor to the fence posts, and must be suitable for the type of conductor. The same applies to connectors which join several conductors together. Last but not least, fence wire is also required, and this depends on the type of conductor used. 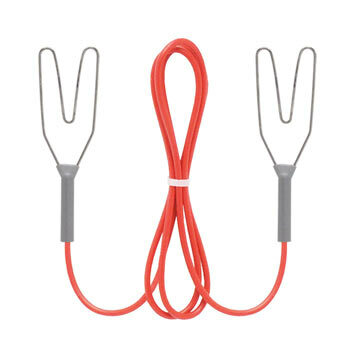 Fence and lead out cables for electric fence tape, for example, generally have a different structure to electric fence connectors for other conductors such as polywire, rope and wire. Why do I need a connector? 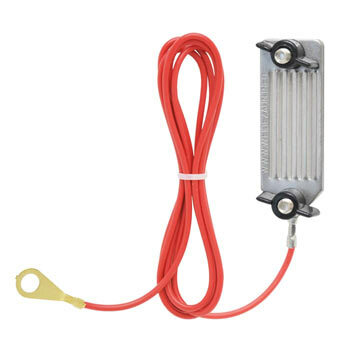 On the one hand, fence connectors are required to connect the energiser to the rest of the fence system and also to the conducting materials. On the other, lead out cables are required for connecting the energiser to the grounding stake. If several grounding posts are used on a long fence system, for example, several lead out cables will also be required. In addition to connectors for grounding stakes, various fence connectors are available for ensuring that the energiser is correctly integrated. 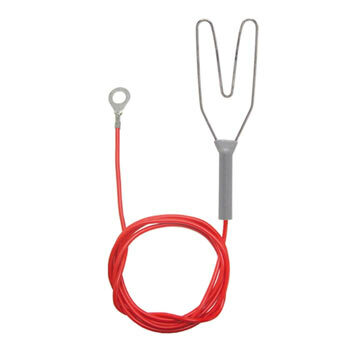 Lead out cables and fence cables for electric fence tape often come with a heart clip. Such models are, in part, universally applicable and can be combined with other conductors in addition to electric fence tape. 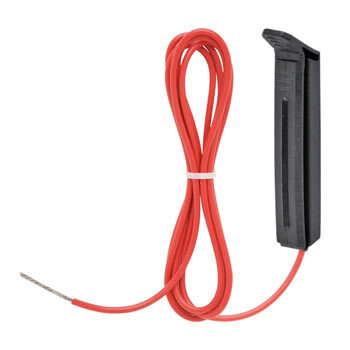 Fence cable for electric fence tape features an eyelet on the opposite end for connecting it to the energiser. The length of cable is generally 1 m which offers plenty of room for manoeuvre. 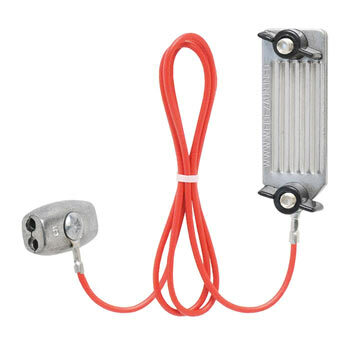 Alternatively, fence connectors with heart clips and galvanised cable ends can also be ordered. 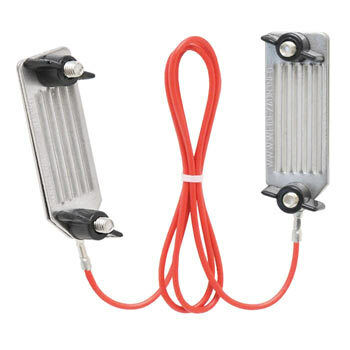 You can also opt for separate connectors for the electric fence which are equipped with heart clips on both ends. Screw-in tape connectors are perfectly suited for electric fence tape and even broad fencing tape of up to 40 mm. The extra-wide contact surface of electric fence tape connectors enables optimum electrical connection. For easy connection, we recommend clip tape connectors for the electric fence which have a broad contact surface for the bundled metal conductors with synthetic fibre woven into the electric fence tape. Similarly, it is worth investing in connectors for broad tape with plastic clips, which can also be quickly mounted. All this is rounded off by fence supply cables with tape connectors, available in various different lengths.